Photo: Clemson's DL: Dexter Lawrence (90), Austin Bryant (7), Clelin Ferrell (99) and Christian Wilkins (42). On the long list of examples documenting Duke’s rebuilt football program under 11th-year head coach David Cutcliffe, add Saturday’s game at Clemson compared to the Blue Devils meeting Alabama in the 2010 season. That was Cutcliffe’s third year of his arduous task upon inheriting a program that had gone 2-33 the previous three seasons, including 0-12 in 2006. The Blue Devils’ 2010 players, who finished the year 3-9, likely put on a brave face when they spoke enthusiastically of the opportunity to host No. 1-ranked Alabama. But deep down they likely knew they were fooling themselves. Duke wasn’t ready for such a matchup with Nick Saban’s Crimson Death Star, losing 62-13. This time, though, the Blue Devils (7-3, 3-3 ACC Coastal) can legitimately imagine themselves challenging the orange-clad Tigers (10-0, 7-0 ACC Atlantic) when they meet at 7 p.m. Saturday at Memorial Stadium. In fact, instead of Clemson losing last week at Boston College to offer a sign of vulnerability, the Blue Devils preferred the Tigers remained unbeaten. With the 27-7 victory, Clemson clinched the ACC Atlantic title and a berth in the ACC Championship game on Dec. 2 in Charlotte. That’s a giant leap from 2010. Oh, the Blue Devils may end up on the short side of a one-sided affair – after all, the Tigers beat then-No. 16-ranked N.C. State 41-7 four weeks ago – but Duke has far more talent and stability in 2018 than 2010. The same is true of the last time the programs met in 2012, when Clemson beat Duke, 56-20. --- Duke is 41-25(.621) overall and 20-12 (.625) on the road since 2013. --- The Blue Devils have gone 7-3 or better in three of the last six seasons. It’s the Blue Devils’ most consistent stretch since 1952-57. --- Duke has earned bowl eligibility for the sixth time in seven years. Prior to Cutcliffe’s arrival in 2008, Duke’s previous bowl trip was 1995. Duke’s 2015 Pinstripe Bowl victory over Indiana was the school’s first since 1961. This year's Blue Devils, previously ranked No. 22 after a 4-0 start, have climbed back among “others” in the poll voting. Duke equals No. 33 in the AP poll and No. 31 in the USA Today voting. Duke’s unbeaten season and No. 22-ranking came to an end when the Blue Devils were dominated at the line of scrimmage in losses to Virginia Tech and Virginia. Since then, the Blue Devils have utilized more empty backfields with quick passes. Duke’s loss at Pitt (54-45) went down to the end, but they followed with wins at Miami (20-12) and last week against North Carolina (42-35). Clemson, though, presents a physical and emotional challenge in a high-voltage environment. The Blue Devils are facing 81,500 fans at a stadium also known as Death Valley. Clemson’s senior class is seeking to set a record for a class with its 51st victory. Harris and his offensive line teammates face an NFL-like task. 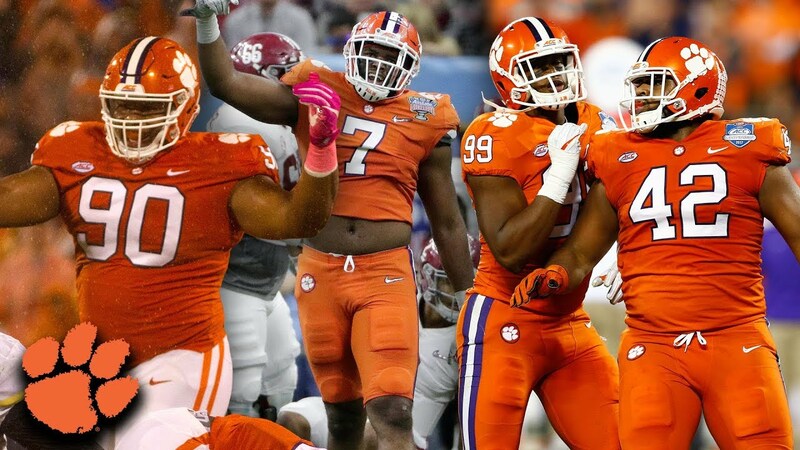 All four Clemson defensive linemen have been projected as high as first-round draft picks. They are, in no particular order, junior defensive end Clelin Ferrell, junior defensive tackle Dexter Lawrence, graduate defensive tackle Christian Wilkins and senior defensive end Austin Bryant. With such talent, Clemson can mount a pass rush without blitzing. The Blue Devils have been playing more sets with an empty backfield in recent weeks to prepare for Clemson. Last week Jones 547 yards set a school record, with 361 passing (31-54-1) and 186 rushing (15 carries). It was his second 300/100 game, making him only the third ACC quarterback to accomplish the double multiple times. The others were Louisville’s Lamar Jackson (three) and Clemson’ Taj Boyd (two). But it’s not only Duke’s offense facing a unit loaded with talent. The Blue Devils’ injury riddled defense faces a balanced and explosive offense. The Blue Devils, who previously lost cornerback Mark Gilbert and defensive end Edgar Cerenord to season-ending injuries, lost safety Dylan Singleton in last week's North Carolina game with a fractured ankle. The Blue Devils are also hoping for the return of linebacker Joe Giles-Harris, who missed the North Carolina game after suffering a knee injury at Miami. Clemson’s offense is averaging 45.7 points a game and 526.6 yards per game with 251.7 rushing and 274.9 passing. True freshman quarterback Trevor Lawrence has flashed so much NFL promise, he earned the starting job, prompting returning starter Kelly Bryant to leave the program after four games with transfer plans. Duke’s players not feeling “uncomfortable” about taking on Clemson is a big step from the program’s history.